I have never encountered this camera before. Strangely enough, it is NOT in the Collector's Guide to Japanese Cameras. 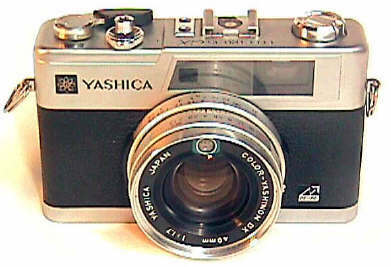 I am told it is the last of the long line of 16 Yashica Electro cameras, vintage 1975. This is an interesting camera with electronic shutter, 40/1.7 6 element lens, aperture priority, parallax correction, nice VF/RF, and convenient controls. Nice VF/RF with Parallax correction. 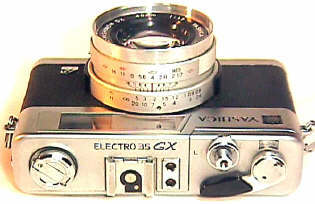 This is the only camera of the CameraQuest Compact 35 RF group besides the Canonet QL17 which has Parallax correction. It's a very expensive feature for this class of compact 35 RF camera. The framelines and RF spot are a gold color, the field of view has a darker green color, creating a contrast that makes the rangefinder and viewfinder lines very easy to follow. CDS cell inside filter ring, to providing exposure compensation with most filters. Flash sync at all speeds via Copal shutter and PC connection. Lens focuses down to 2.6', slightly closer than usual for this camera class. No manual exposure over-ride possible, other than adjusting ASA for compensation. NO indication of shutter speed, only LED's indicating OK/Not OK. This is a very nice handling, not well known camera. Appreciate it if you can find it. This group shot compares the size of the black Yashica 35CC, the Yashica 35GX, and the Olympus 35RD.